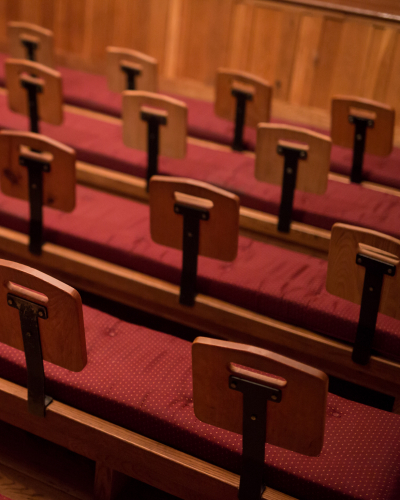 Today, modern Americans bring our anxieties about war, religion, race, the economy, and politics with us when we go to see movies or when we watch TV. 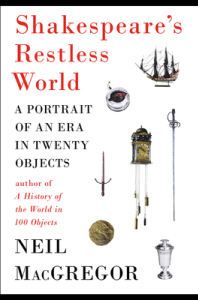 In Shakespeare’s Restless World: A Portrait of an Era in Twenty Objects, MacGregor explicates how the Elizabethan and Jacobean audiences did exactly the same thing — just with different particulars. This book is a material history wherein the author hopes to illuminate the “mental scenery” that 16th and 17th century audiences would have brought with them into the playhouses. MacGregor uses twenty physical objects, many of them recovered from the banks of the Thames or the ruins of various theatres, to structure his chapters, and the conceit works very well. A Venetian glass introduces the chapter on London’s burgeoning status as a center of trade, in competition with Venice. Gold coins from Morocco sets the reader up for a discussion of race relations in early modern England. A silver communion cup from Stratford gives us a glimpse into the fraught state of religion in the 16th century. A humble woolen cap, probably belonging to an apprentice, opens up the world of London’s vast working class, their daily habits, and the restrictions on their clothing. Some other artifacts are paper or paint: a portrait detailing the Tudor succession, rejected designs for the Union flag, a royal proclamation, sketches for the triumphal arches used during James’s coronation parade. MacGregor ties these objects not just to their historical context, but also to Shakespeare’s plays, conjecturing on how certain props or staging moments would have held specific connotations for the original audience. Through these links, he also gives the reader a fairly comprehensive view of political, religious, and social history of the 16th and 17th centuries. The writing throughout the book is accessible, and also quite witty on occasion — see what he does with Venus, Adonis, and the plague in Chapter Seventeen. Another great linguistic moment is in “The Theatres of Cruelty,” modeled around the eye relic of Jesuit martyr Edward Oldcorne (his right eye, in fact, placed in a silver box), where MacGregor notes that many of Shakespeare’s head-chopping, eye-gouging, tongue-eviscerating stage directions are “what we would call strictly post-watershed.” The cleverness never hits you over the head in a self-conscious way, but it suffuses the book thoroughly enough to add felicity to what could easily have been a dry tome. This is also just a nice book to hold. Since it was produced for the British Museum, it’s printed on heavy paper, with all the pictures embedded with the text they relate to, rather than stuffed into a glossy insert. The last chapter of the book is the one of these things that is not like the other: a modern artifact. MacGregor brings the book full circle by talking about how “Shakespeare Goes Global.” He makes the important observation that while the original context of the plays clearly matters (as is the premise of the entire book up to that point), the plays also have the ability to create new context for themselves in the modern world. Two examples from this chapter are particularly heartstring-tugging: a line from Richard III echoing through the mind of a German-Polish Jew in Warsaw, 1942, and the grounding artifact for the chapter, a Complete Works owned by Sonny Venkatrathnam on Robben Island, the South African jail made infamous during the anti-apartheid movement of the 1970s. These stories illustrate with poignant accuracy just how much Shakespeare’s words find ways to speak to new generations, all over the world. MacGregor also connects this universality back to the 17th century, underscoring that Shakespeare’s proliferation and posthumous popularity might never have been possible if not for the 1623 First Folio. Overall, Shakespeare’s Restless World is thoughtful, well-organized, and thoroughly interesting, start-to-finish. I highly recommend it to anyone with an interest in Shakespeare or in the Tudor-Stuart era, or to anyone who’s interested in material history in general. It’s an easy enough read that it shouldn’t scare off casual readers, but it showcases enough particular moments in history to hold the attention of a more advanced scholar. You don’t get a dispassionate textbook walking you through a timeline of events, but rather a series of windows into the real lives of Elizabethan and Jacobean citizens. Shakespeare’s Restless World provides a wealth of information, but in a unique format, giving the reader a panoramic view of early modern London through the varied lenses of twenty concrete objects.